There are times such as shooting a beach, or snow scene, on a sunny day where the range of brightness between the lightest and darkest areas can be extremely wide. The camera' sensor can thus lose detail in both the highlight and shadow areas of the scene and delicate details will either be converted to white or black. Most cameras have contrast setting control and by changing this setting to "less contrast" you can increase the camera's ability to capture the extremes of the scene and preserve otherwise lost light and dark details. At other times your subject will not contain enough difference between shadows and highlights. This situation results in a low-contrast or "flat" image. Usually you might find you get flat images in a heavy overcast day. Altering the camera' settings to "more contrast" will spread the tonal values of the scene over the whole range of the sensor so that the resultant picture will contain acceptable contrast. for achieving high quality images. The problem is that it is often difficult to judge whether a scene has too much or too little contrast just by looking on the LCD monitor. It is with the help of the histogram function which visually graphs the spread of the pixels in an image that you can determine whether your image is too flat or too contrasty. 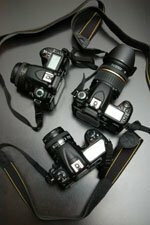 Many cameras let you display histograms on the LCD monitor in playback mode or while reviewing an image you have just taken. A few cameras even let you see the graph as you are composing an image. What is a Histogram ? The histogram is a graphical representation of the relative amount of information stored in each color channel in your image. Basically this means that it displays how many pixels are dark and light in your image and how they are distributed. The horizontal axis represents the brightness level of the image and the image's maximum potential tonal range or contrast. Pixels can be sorted into 256 levels of brightness from black with value of 0 (shadows) representing the darkest part of the the image to pure white with value of 255 (highlights) representing the lightest part and with 254 gray levels in between. Think of it as a line with 256 spaces on which to stack pixels of the same brightness. The vertical axis represents the number of pixels that exist for each brightness level therefore the higher the line coming up from the horizontal axis, the more pixels there are at that level of brightness. The key point is that you can use the information to tweak the brightness and contrast of your image. Watch this short video for a visual illustration of what a histogram is and what it measures. To play the video press the PLAY button in the player controls. Get in the habbit of using the histogram review feature of your digital camera. Set your camera to display a combined thumbnail and histogram for 5-10 seconds after every frame. In most real world situations there is no such thing as an ideal or "perfect" exposure. There is simply one that places the tonal values found in the scene most appropriately within the capability range of the camera's imaging chip. There really is not such a thing as the "right" histogram. Because of that you look for the most appropriate graph for how you want your image to look. It simply shows you the way things are, and it is then up to you to decide if what it is telling you needs to be acted upon. To read the graph, you look at the distribution of pixels in the image. Many photos look best and have a good exposure when the mid-tones found in the image fall roughly half way between the darkest and the brightest values using the entire tonal range. Notice in the graph on the left that the shadow area starts at 0 and builds up gradually as well as there is a smooth curve downwards ending in 255 indicating that the subtle shadow and highlight details are preserved. The histogram on the left indicates there are a lot of pixels with value 0 or close to 0. Unless there is a lot of pure black in the image, there should not be that many pure black pixels. Otherwise, this is something you would want to avoid as it is an indication that some shadow detail is lost forever - the shadows are "clipped". There are also very few pixels in the highlight area overall resulting in an underexposed image (too dark) . On the other extreme is the graph on right where the majority of pixels are with value 255 or close to 255 indicating loss of details in the subtle highlights of the image - the highlights are "clipped". There are also very few pixels in the shadow area resulting in an overexposed image (too light) . Image editing software can be used to adjust an image histogram by using commands that spread the pixels so they cover the entire available tonal range. These controls allow you to adjust the shadow, midtone, and highlight areas independently without affecting the other areas of the image. This lets you lighten or darken selected areas of your images without loosing detail. "clipped" to pure white or black. A graph that only contains midtones will result in a hazy image with little contrast. While an image with too much contrast will exhibit spikes at both the dark and light values resulting in "clipped" shadows and highlights. As we have seen, one thing you want to avoid is overexposing highlights so they become so bright, or "clipped", they loose details. To help you avoid this many cameras a highlight warning when you review your images. Overexposed areas of the image that have no detail blink or are outlined in color.